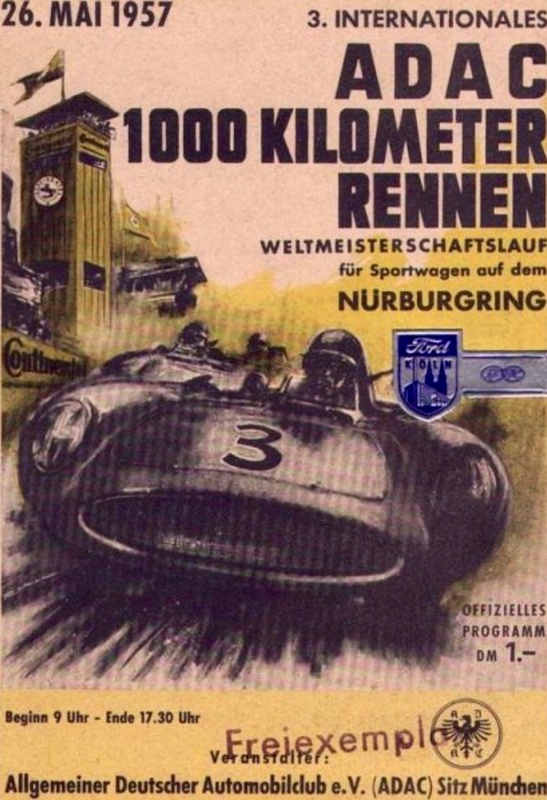 The 1959 event was held at the ‘Automobil Verkehrs und Ubungs-Strasse’ (AVUS) track in Berlin rather than its Nurburgring ‘home’. 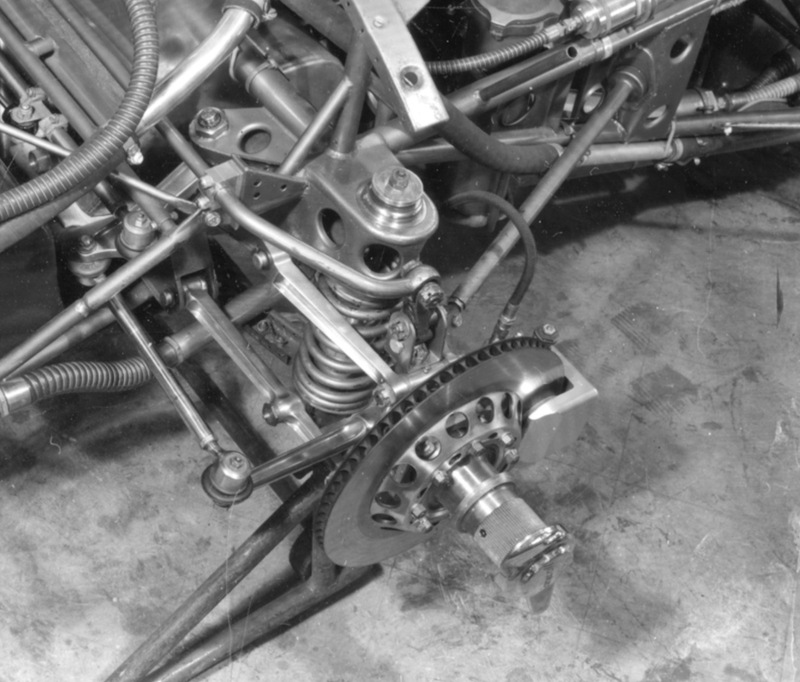 The vastly quick, banked track was tailor made for the Ferrari Dino 246 which had more power than the Cooper brigade, but considerably less handling. 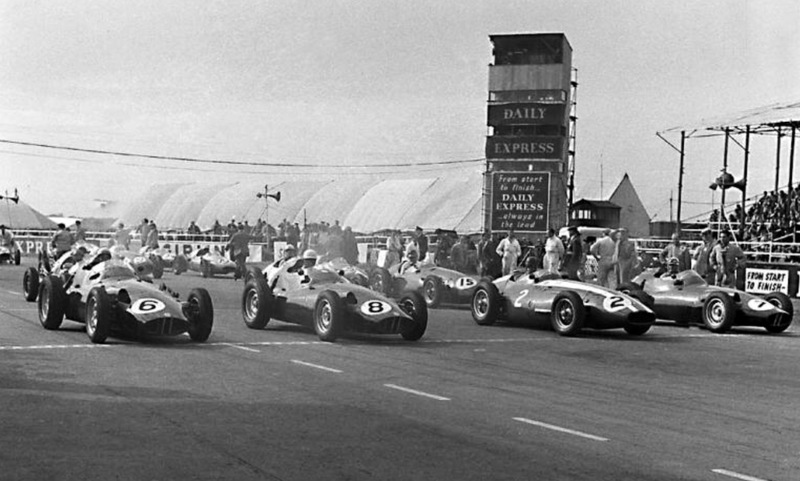 The recent partitioning of Berlin meant that a new south loop was added to the facility which dated back to the 1920’s. 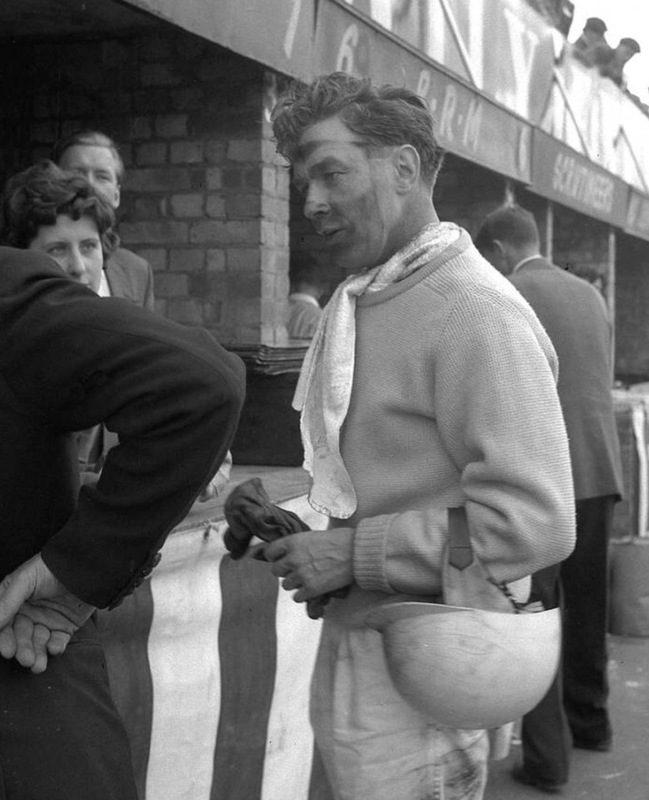 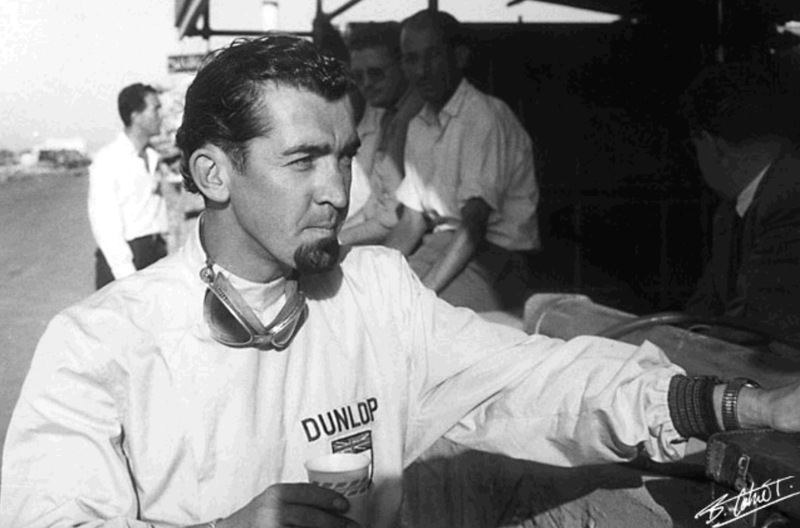 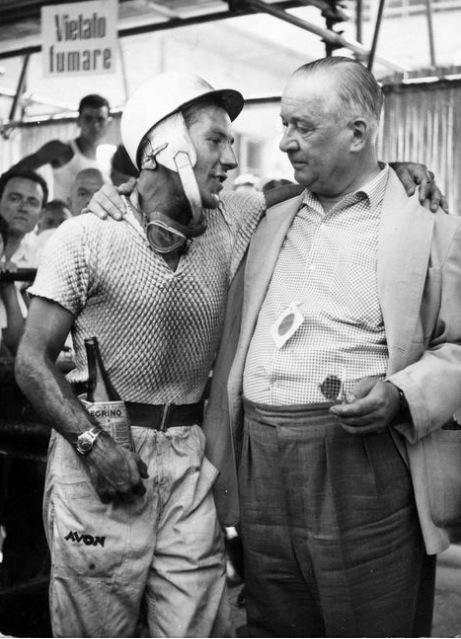 Brooks arrived full of optimism, he had won on the super fast Reims road course on 5 July several weeks before. 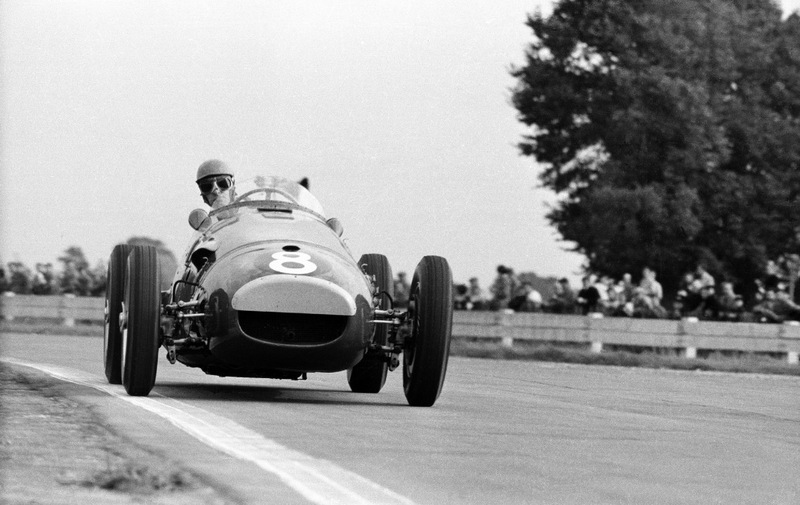 The Ferrari’s were right on the pace with Brooks taking pole from Moss’ Cooper T51 with Dan Gurney 3rd in another Dino. 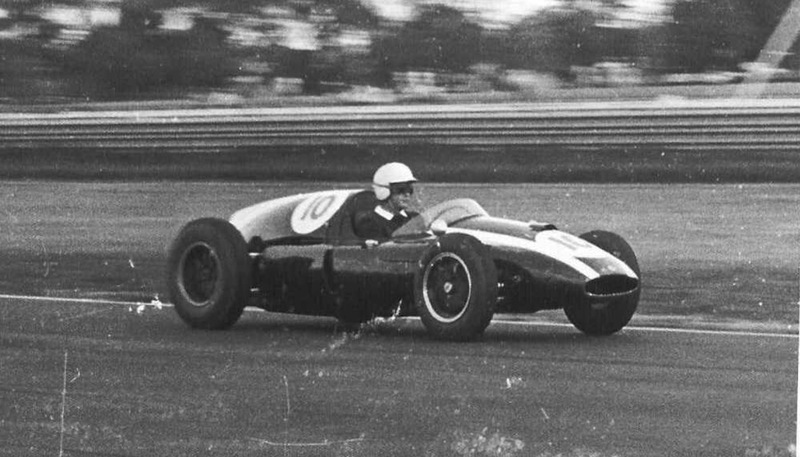 Due to fears of tyre wear the race was run in two heats, Brooks won both of them. 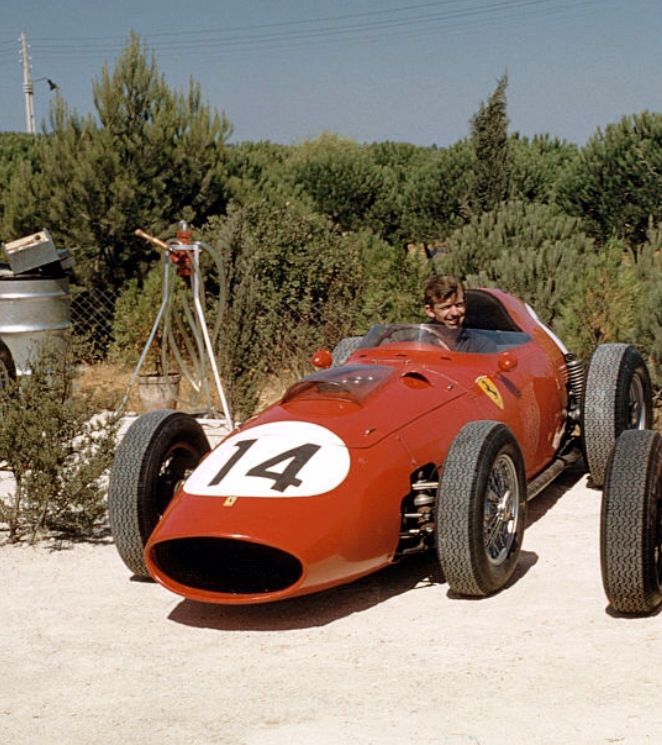 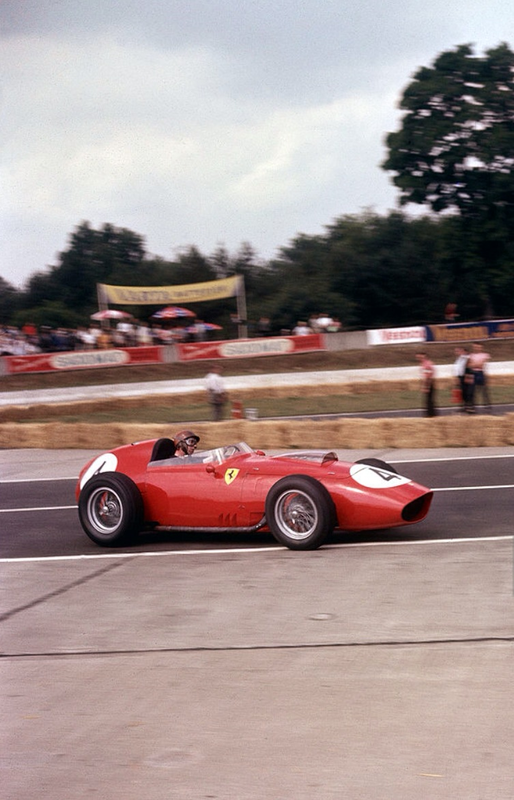 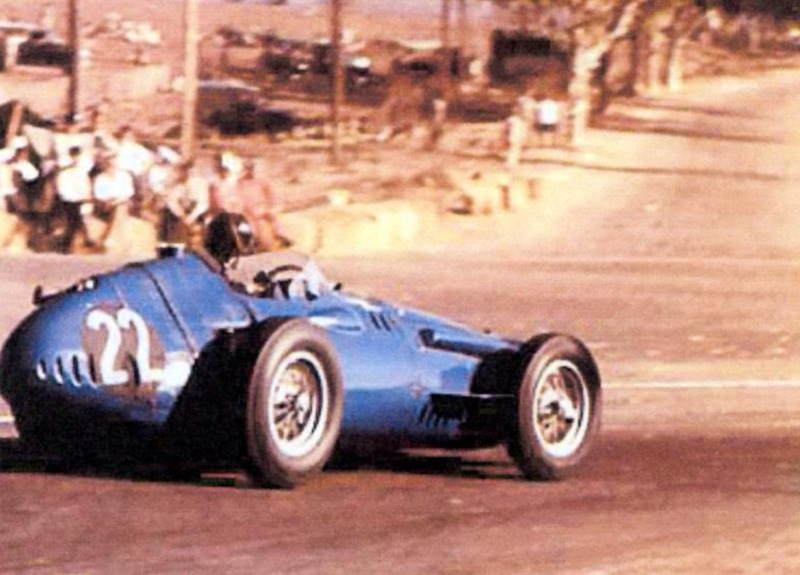 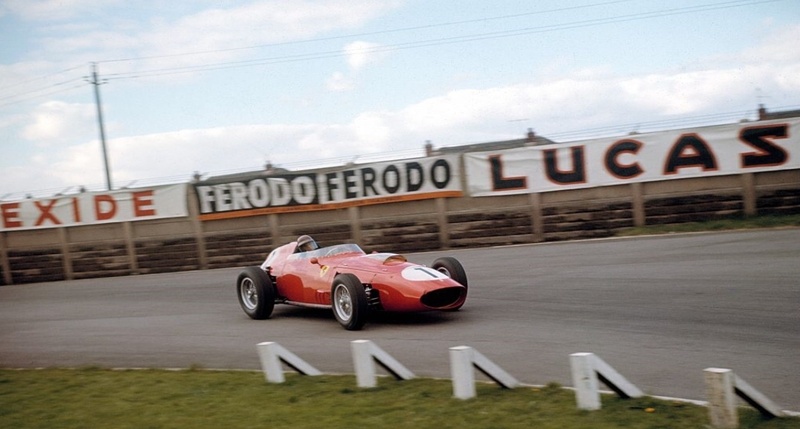 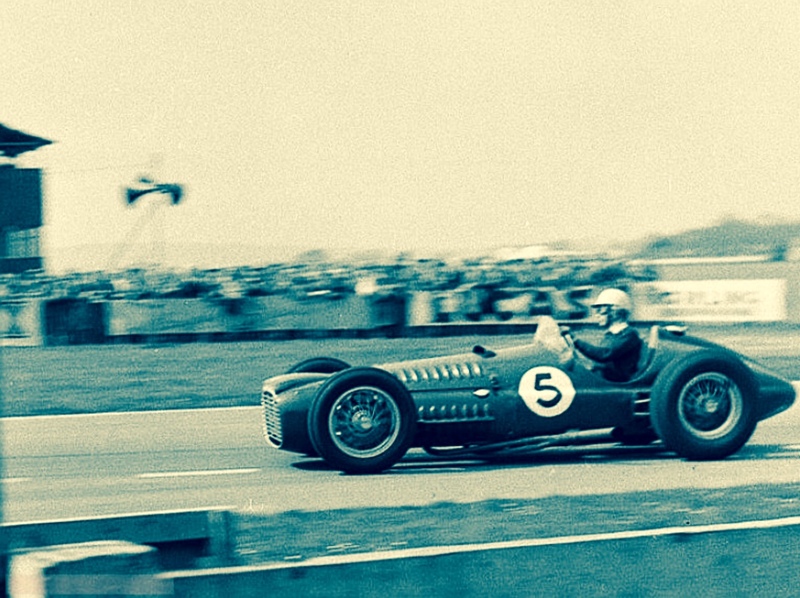 The minor placings also went Ferrari’s way to Gurney and Phil Hill. 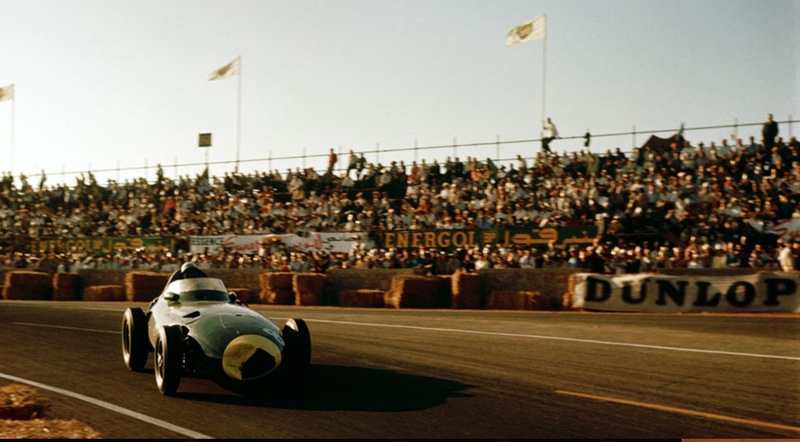 The weekend is also famous as a consequence of Hans Hermanns survival of one of the most spectacular GP accidents ever. 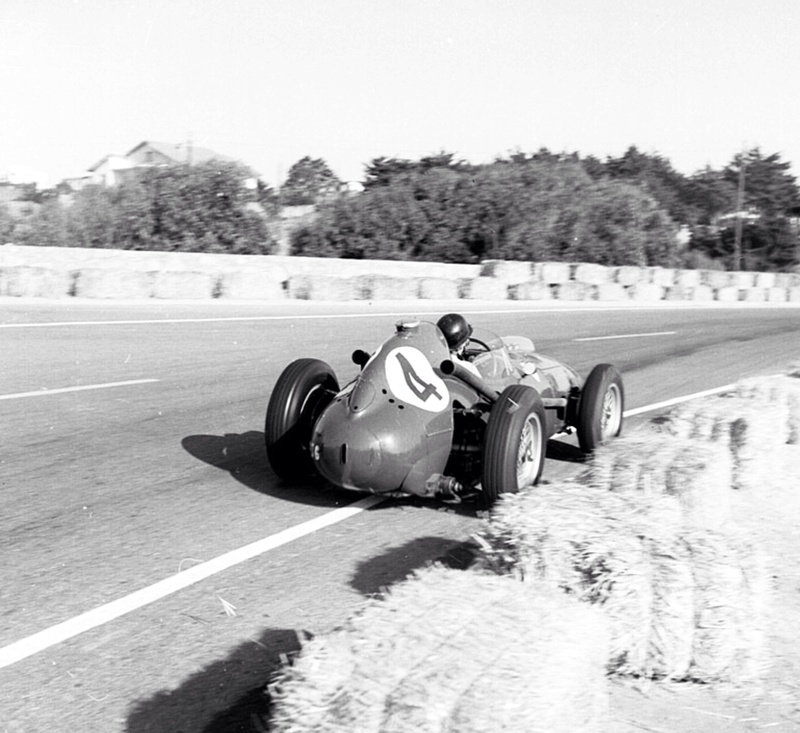 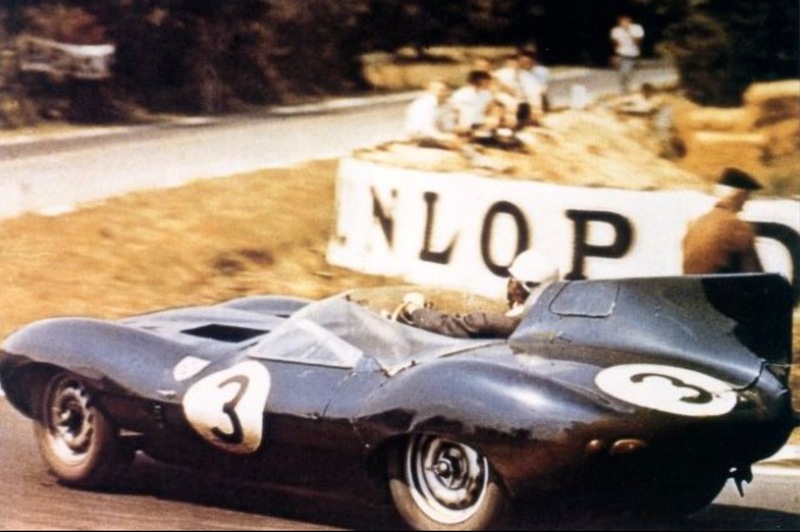 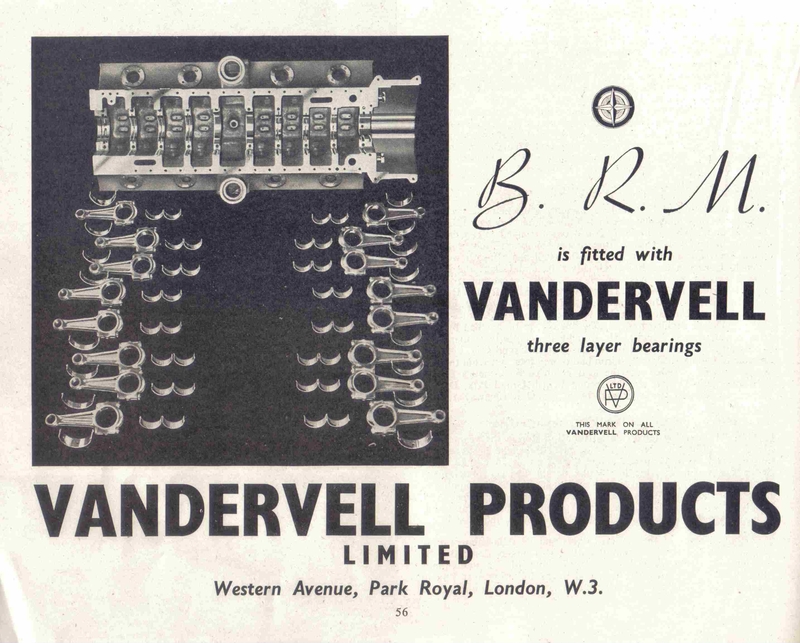 His BRM P25’s brakes failed on lap 35 of 70, the car hit hay bales and was launched into a series of somersaults with Hans thrown clear and escaping serious injury. 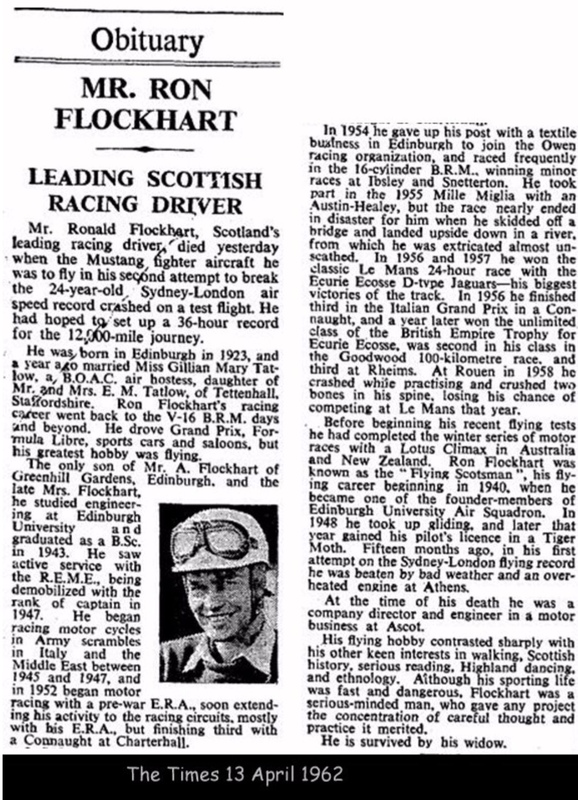 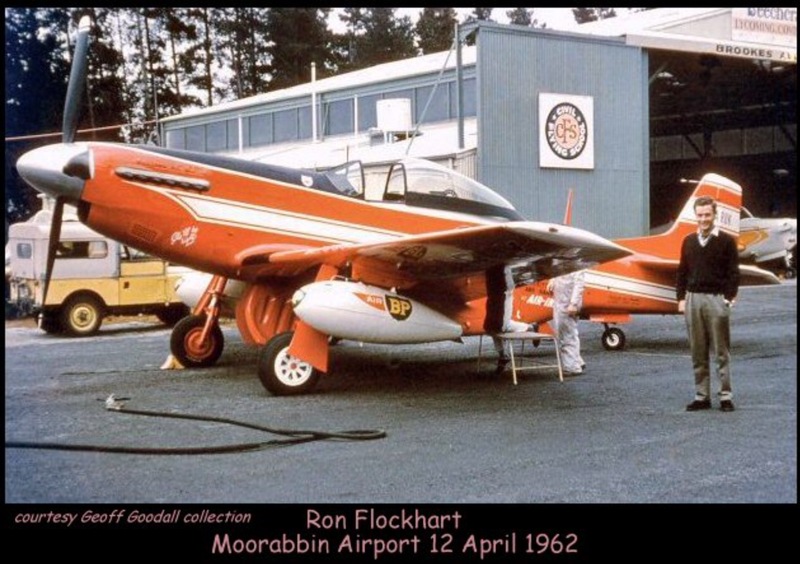 He was a very lucky boy. 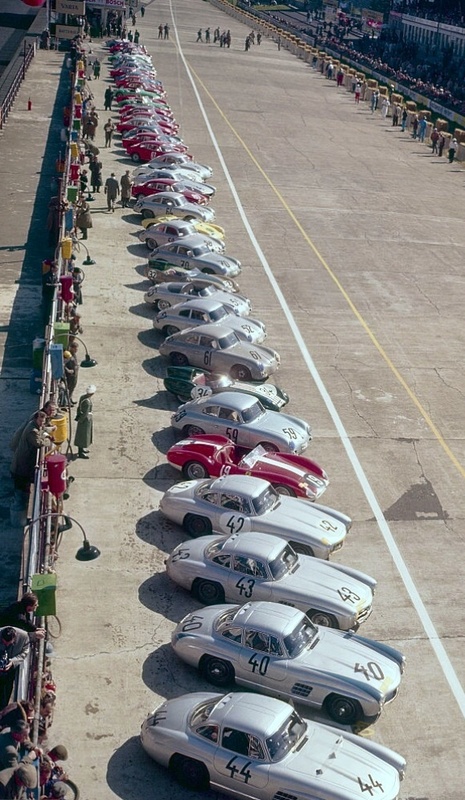 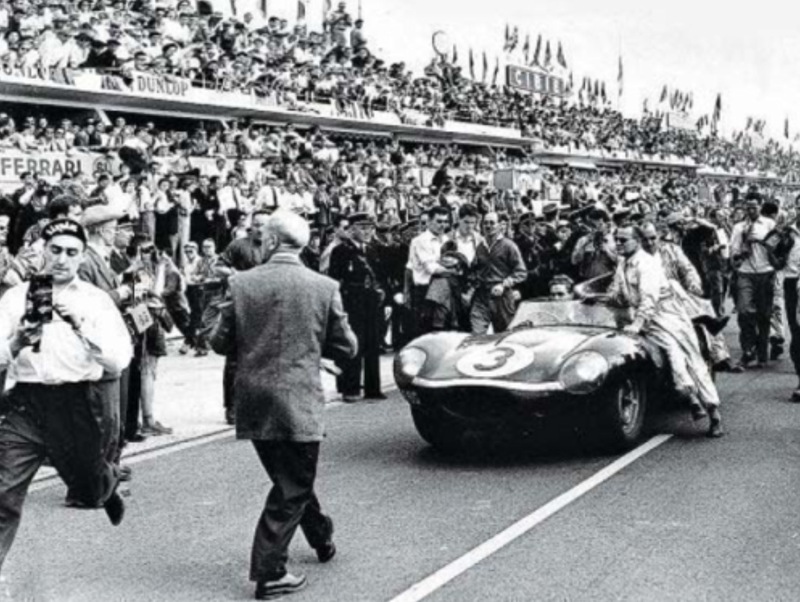 The meeting was overshadowed by Jean Behra’s death in a supporting sportscar race, the little Frenchman died instantly after spinning his Porsche RSK and hitting a flagpole in mid-air. 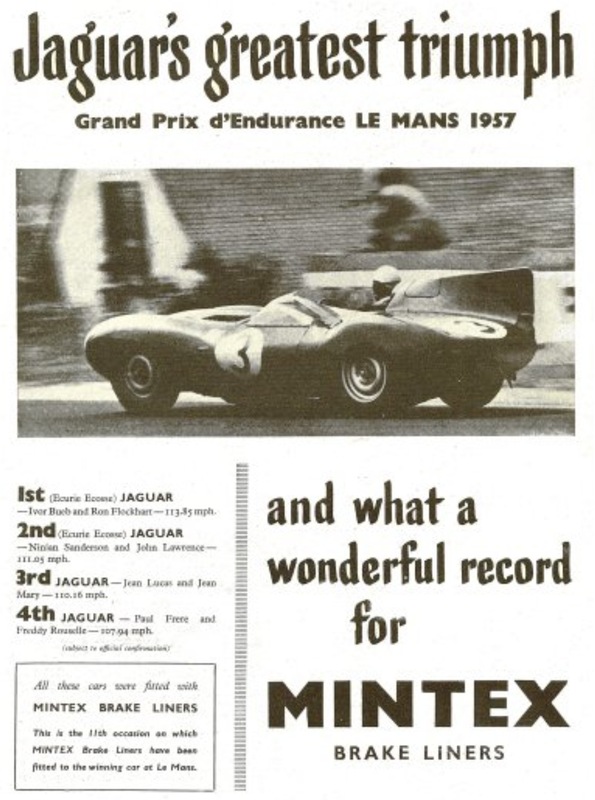 Jean’s 1959 season I covered in an article, click on the link at the end of this piece to read it. 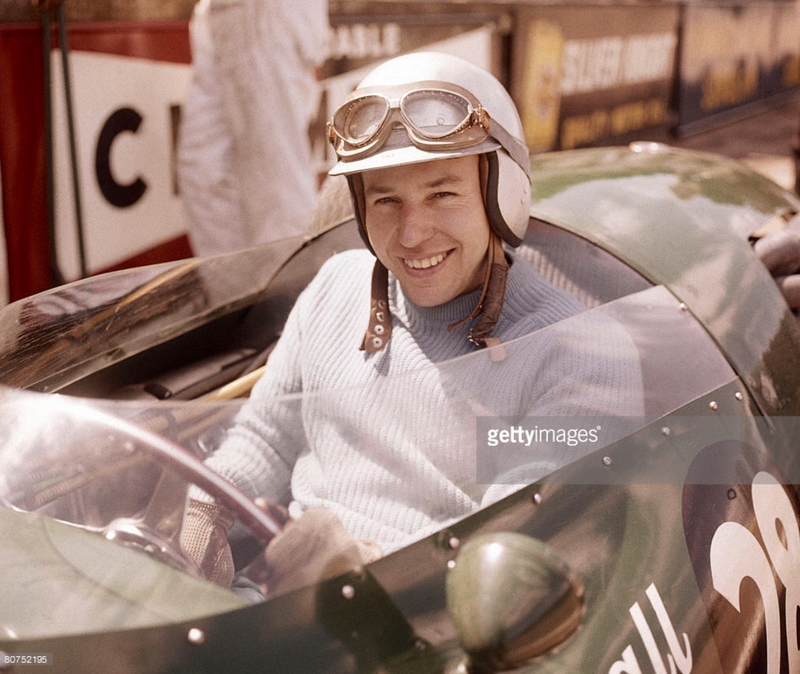 Brooks looking relaxed before the Portuguese GP at Monsanto, Lisbon. 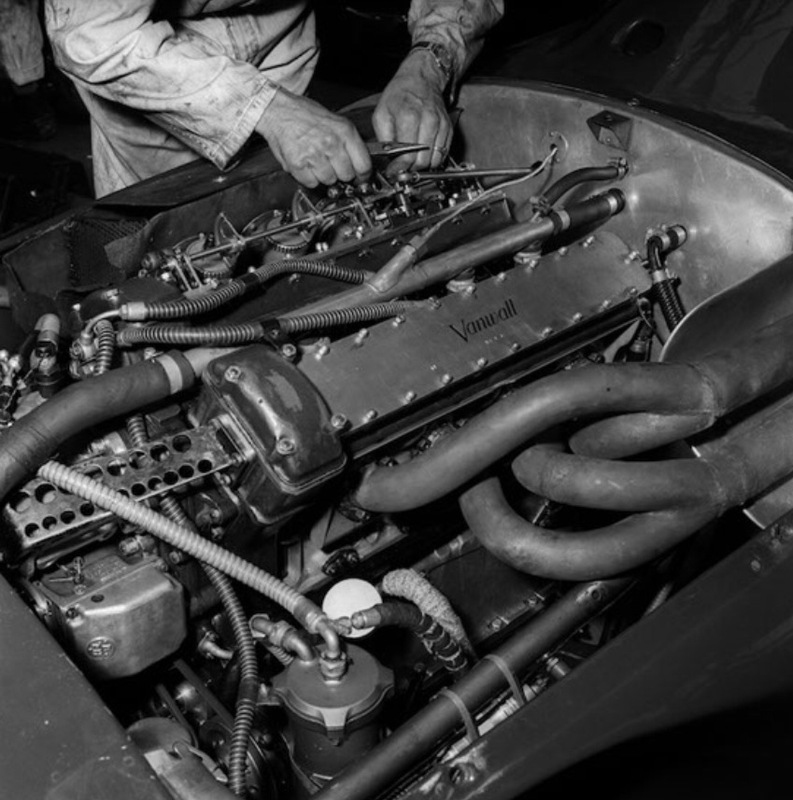 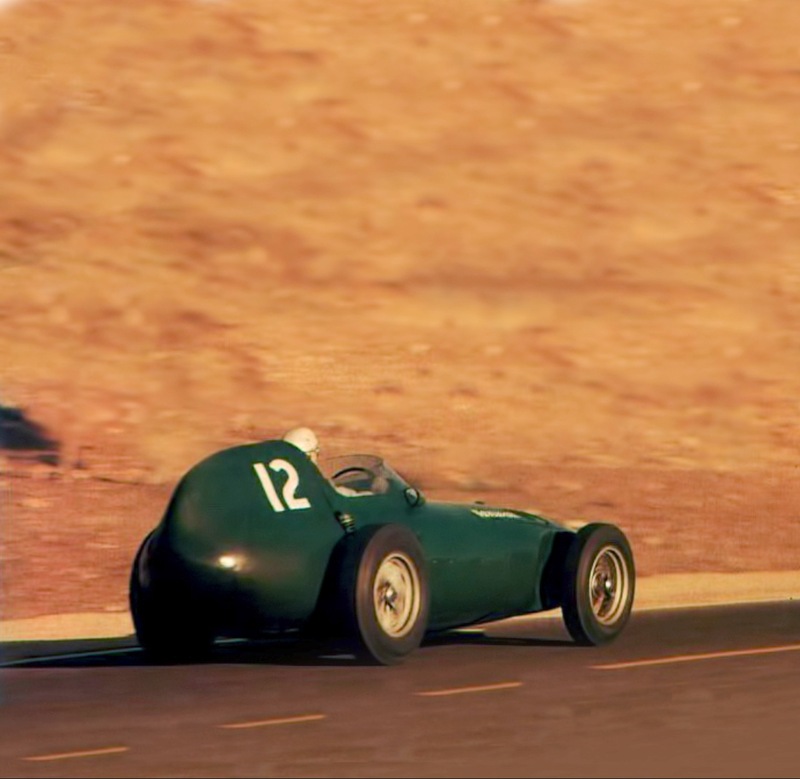 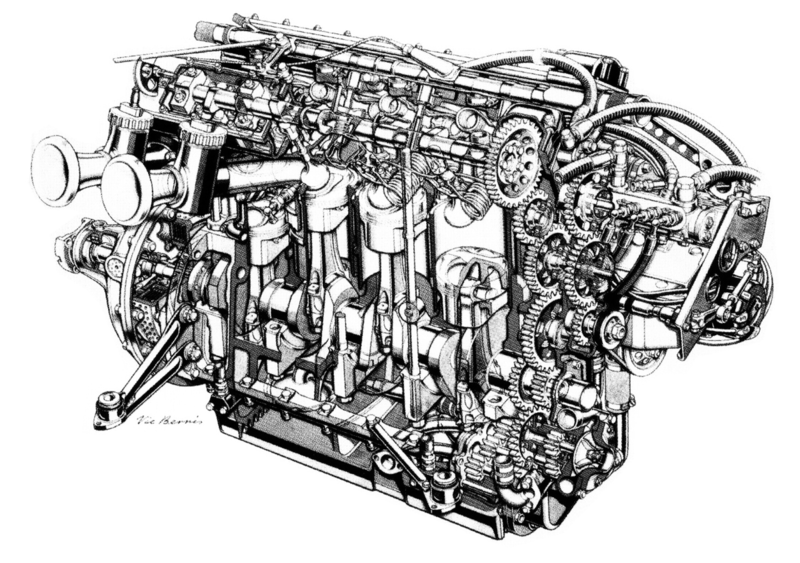 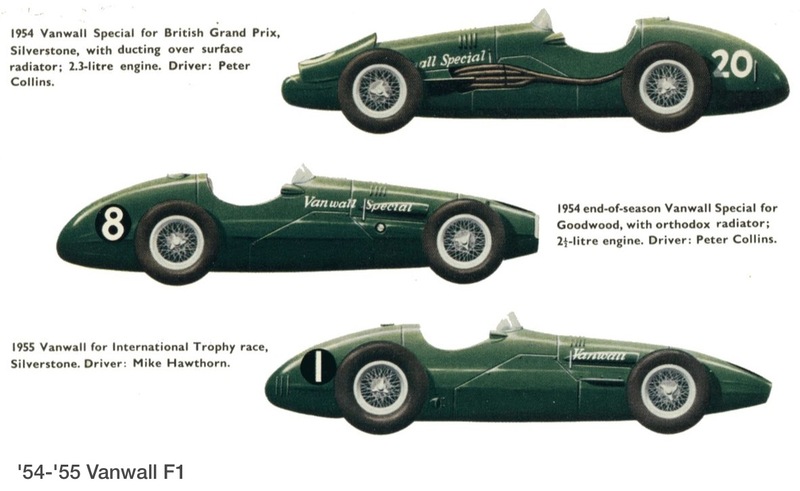 The 23 August race was won by Moss from Masten Gregory, both in Cooper T51 Climaxes, Gurney was the best placed Ferrari in 3rd with Brooks 9th- about where a good front engined car could expect to finish as the mid-engined paradigm shift gathered pace. 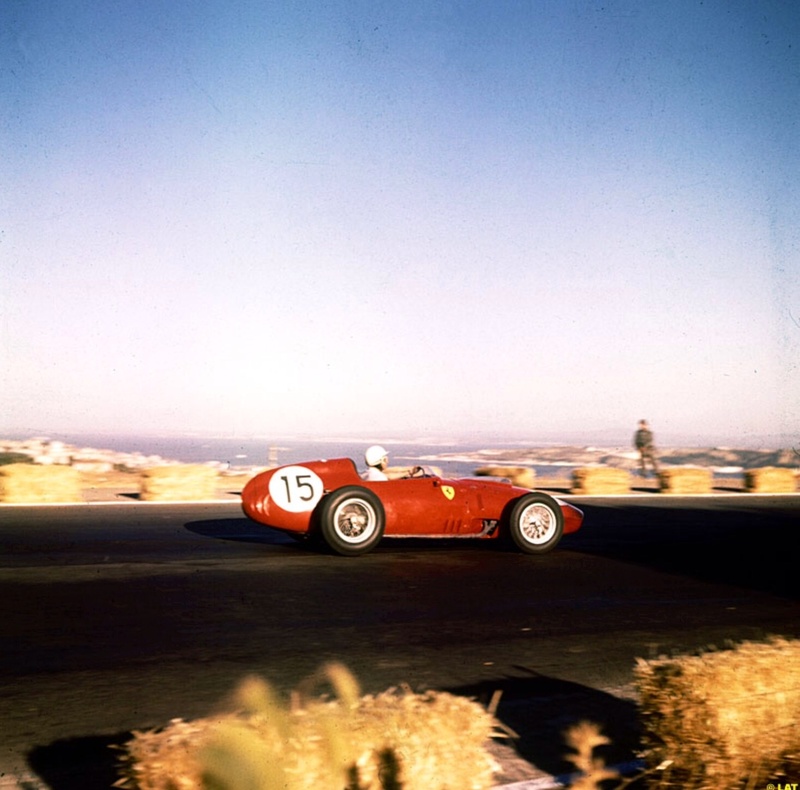 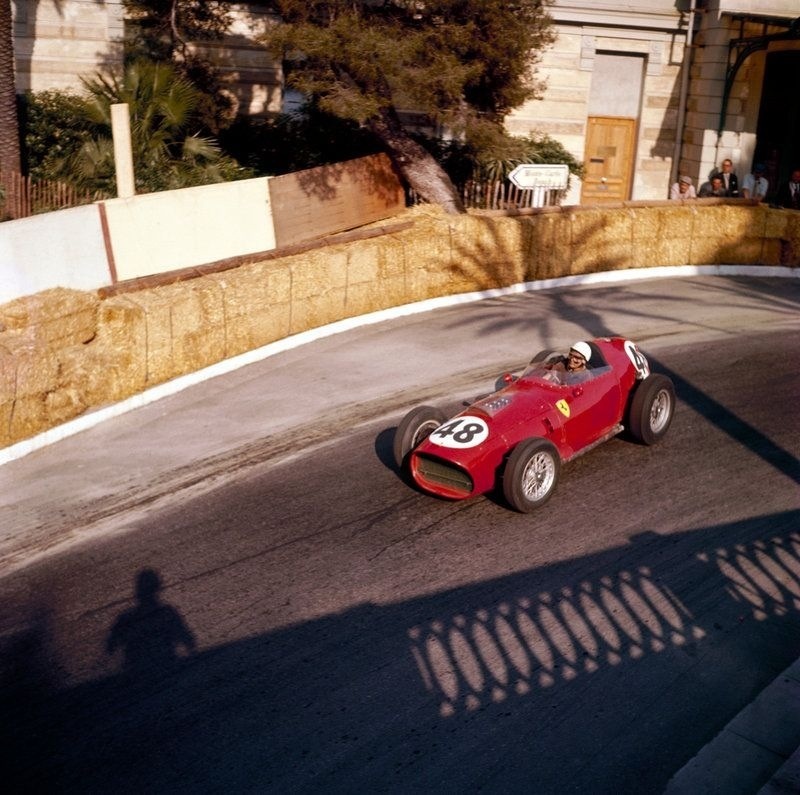 Take a careful look at the composition and execution of this shot of Phil Hill’s Dino at Monaco in 1959; the use of light, the way the shadows of the palm tree and building architecture frame the shot of the snub-Monaco nosed Ferrari 246 and the expression on the American drivers face. 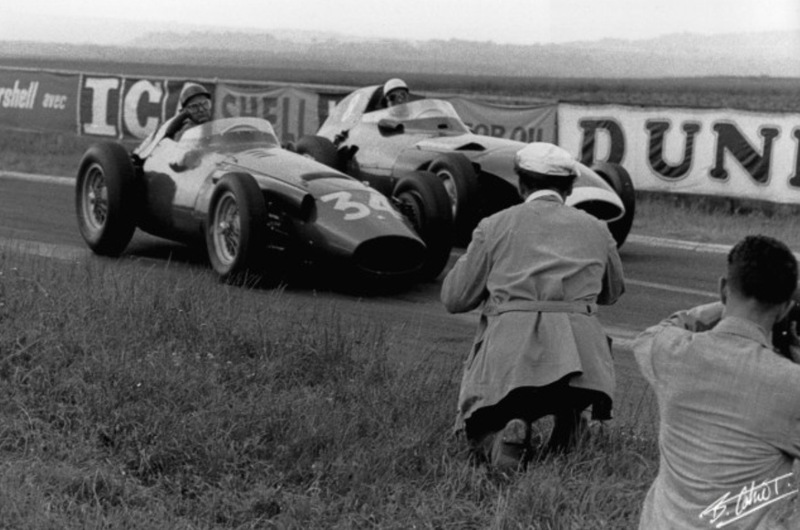 The shadow of the photographer gives a sense of involvement. 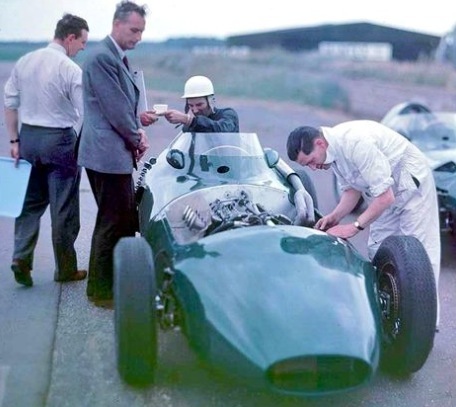 Things were pretty tough for the front engined brigade by ’59 of course, Jack’s first Cooper title was bagged that year. 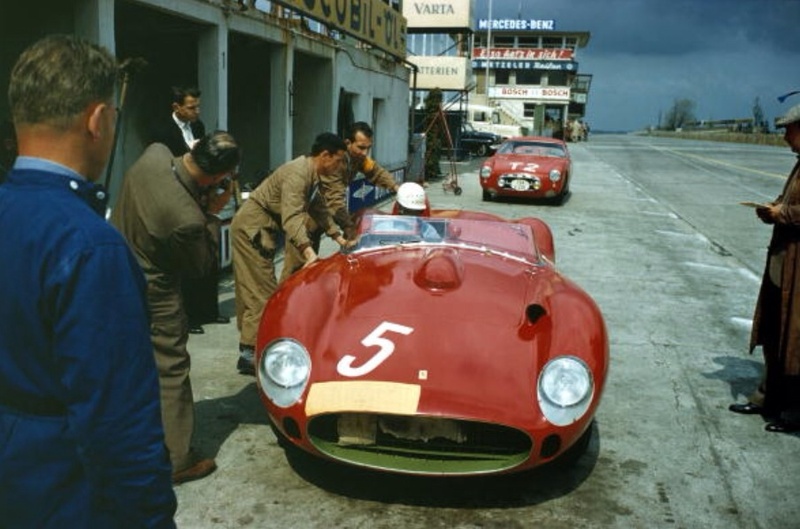 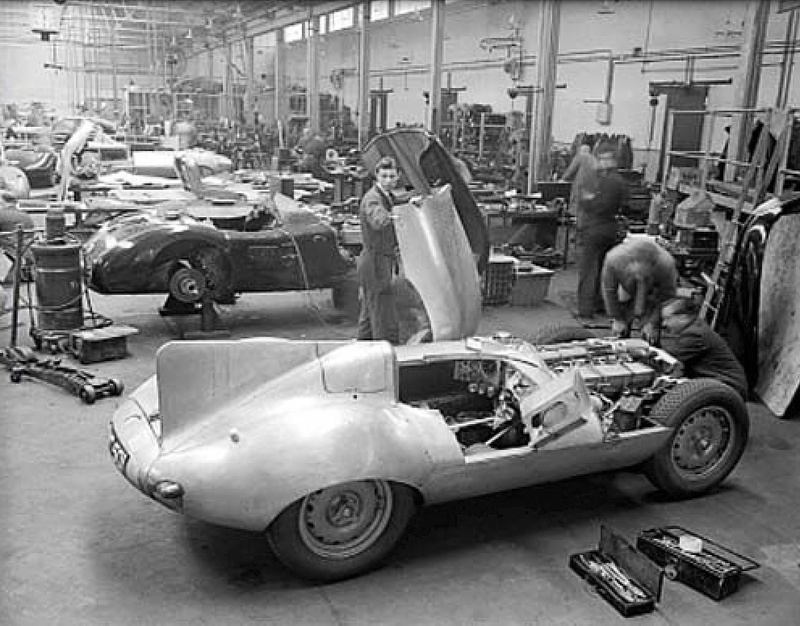 In the process of trying to keep up, Enzo’s brigade created quite the most beautiful cars in these later Dino’s. 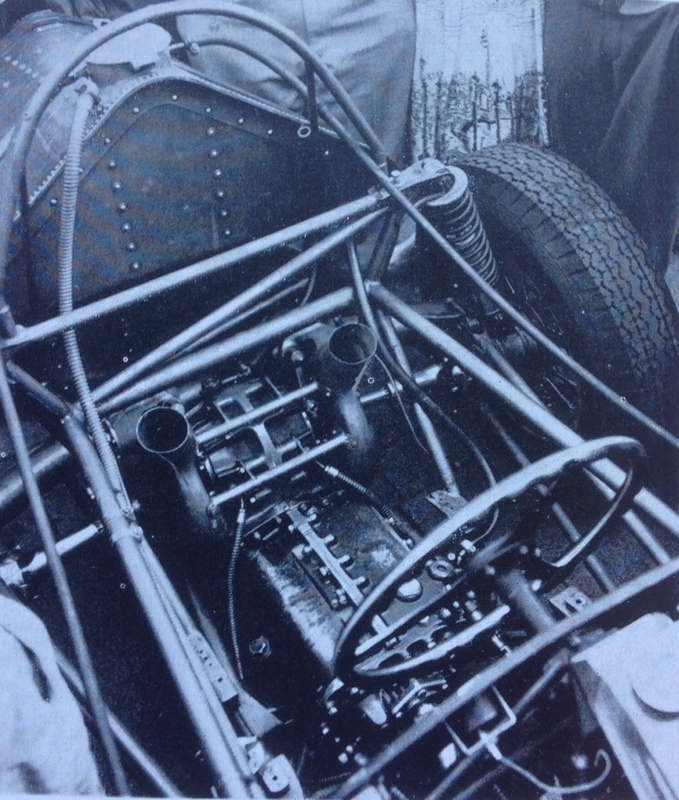 The snub nosed car not so much but checkout Tony Brooks slinky, curvaceous chassis above during the BARC 200 at Aintree on 19 April ’59. 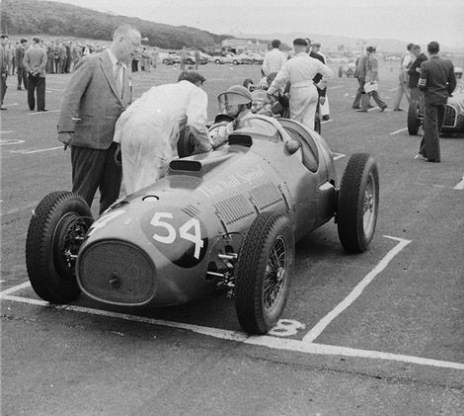 Jean Behra took the win that day in a sister car, the Scuderia may have been lulled into a sense of false security by this non-championship event result. 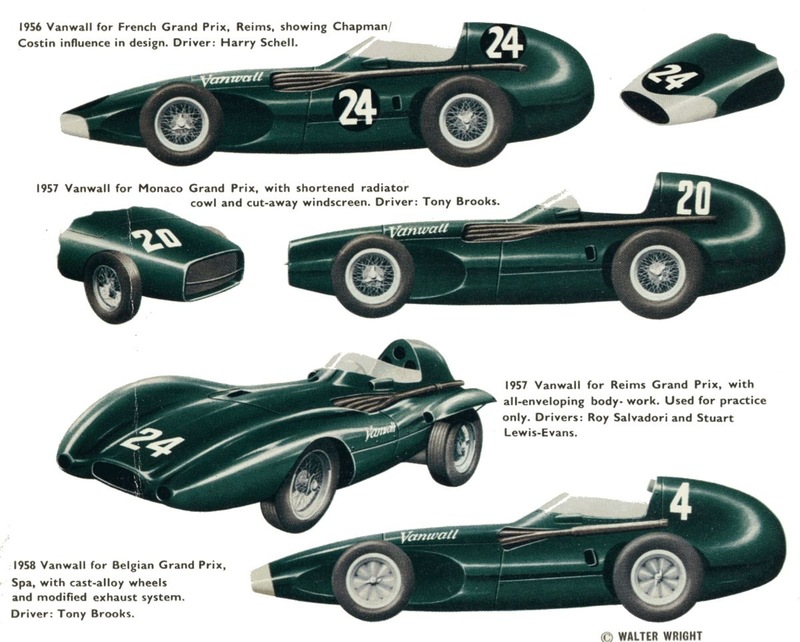 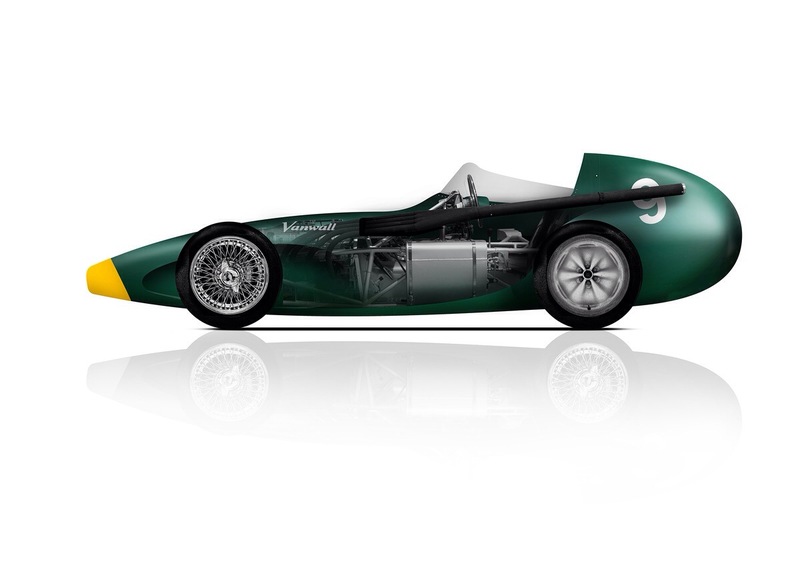 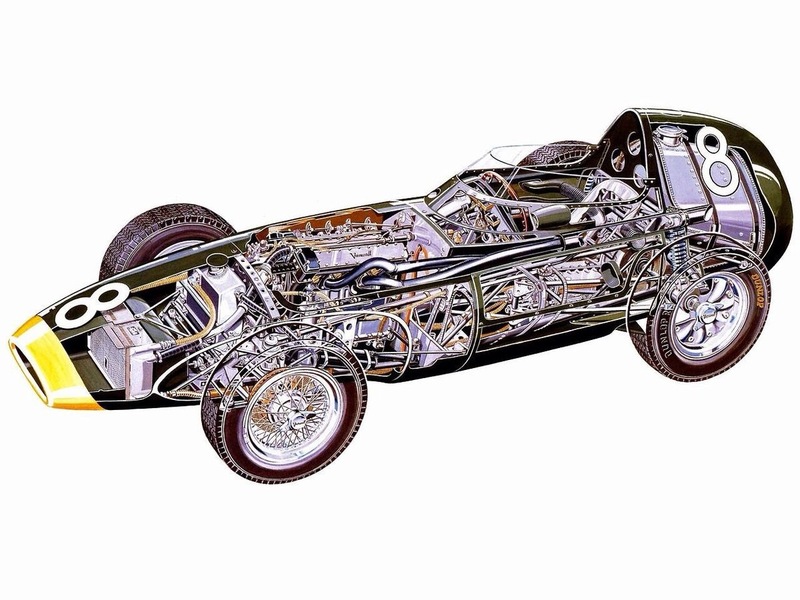 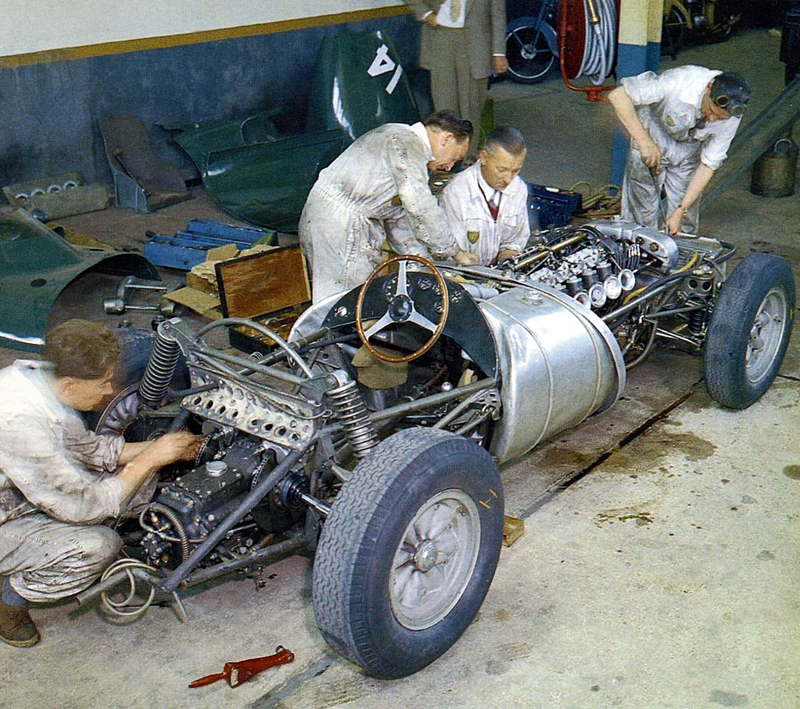 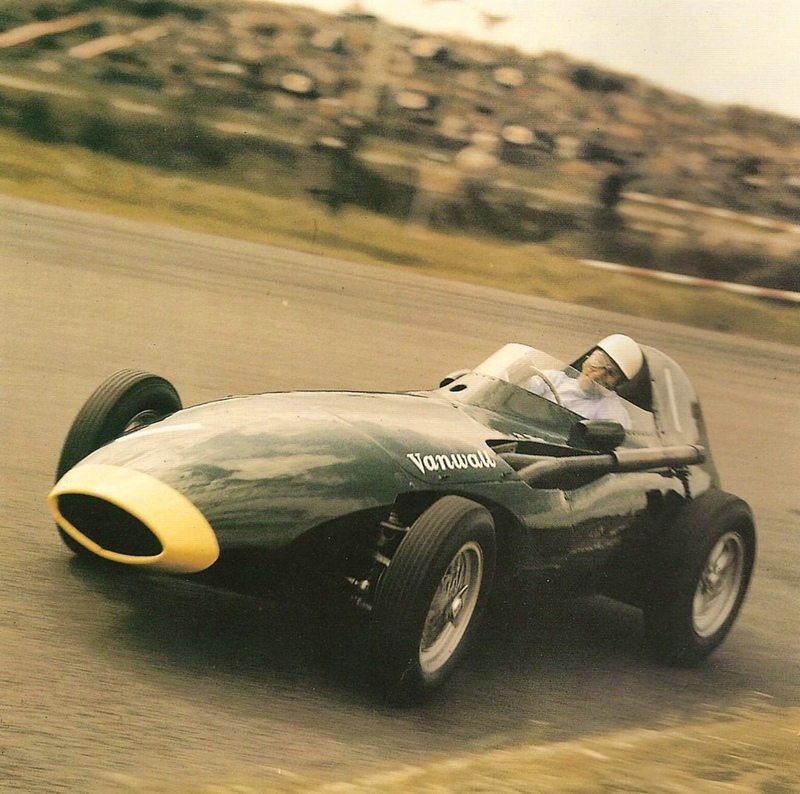 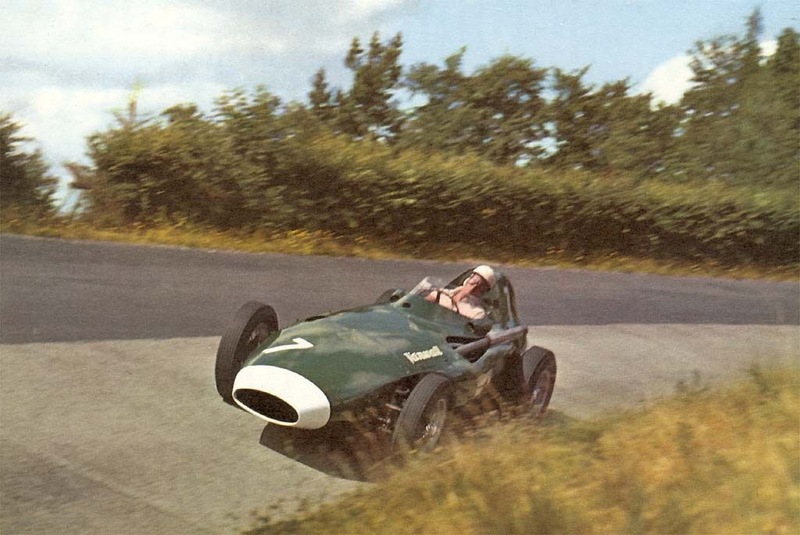 It was very much a Cooper T51 Climax year; they won three of the five non-championship events (Moss took 2, Brabham 1) with Ferrari and BRM taking one apiece (Behra and Flockhart). 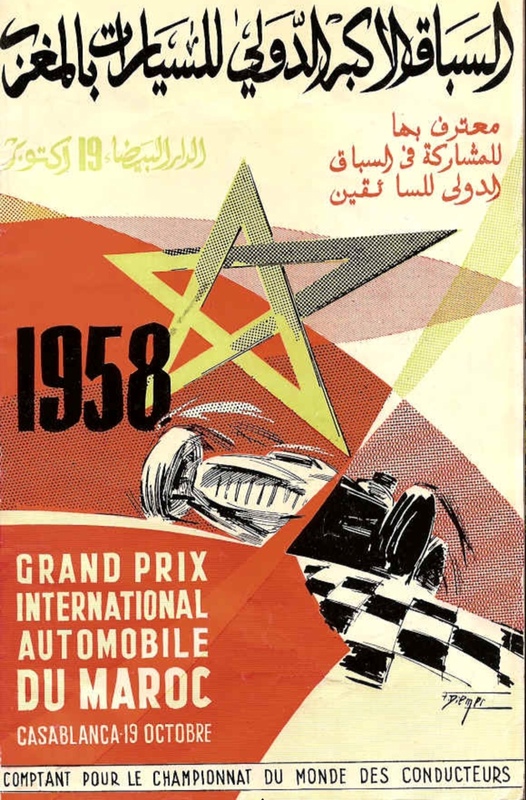 Ignoring the Indy 500 which was part of the world championship back then, there were eight GP events. 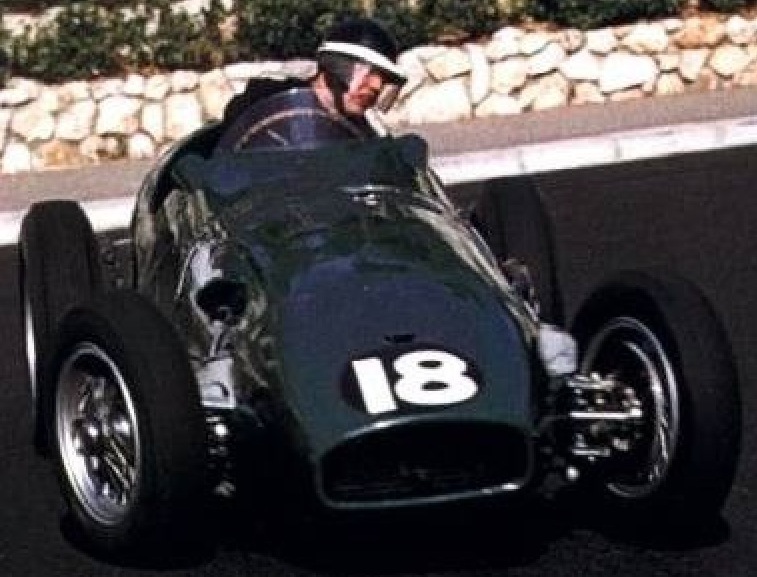 Cooper won five (Brabham-Monaco, British and Moss-Portugal and Italy 2 races each for the Aussie and the Brit and McLaren-US 1 win). 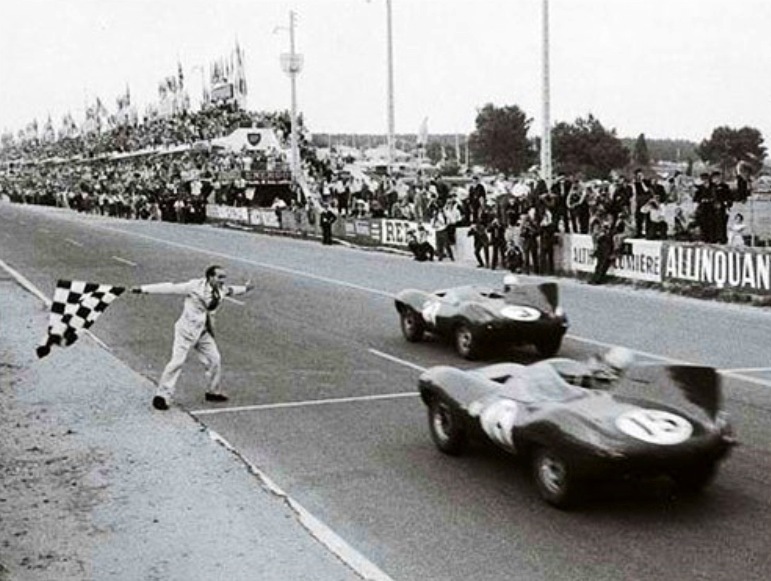 Ferrari won two (Brooks-French, German) and BRM won one, the break-through first win for the Bourne marque and Jo Bonnier aboard a P25 at Zandvoort. 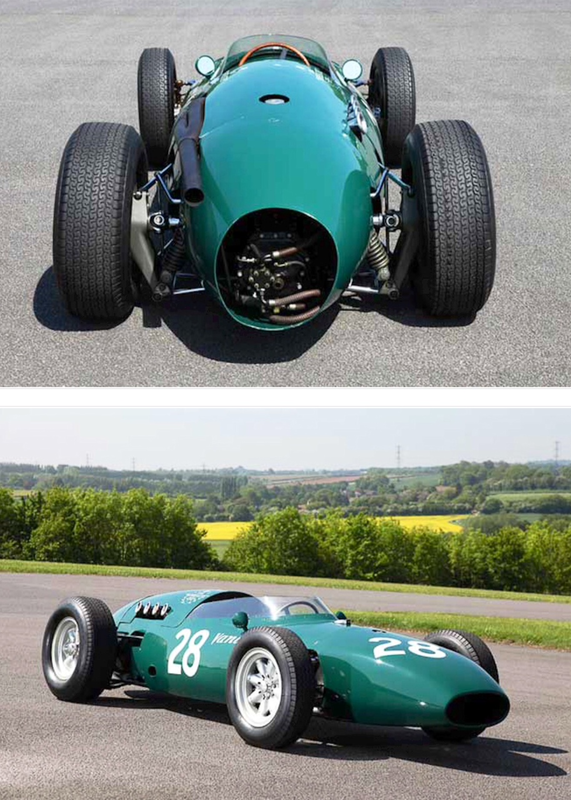 Its front is a little ‘fugly’, the looks only a mother could love, ‘snub nosed’ Dino, Hill rounding the Gasworks Hairpin, Quay in the background. 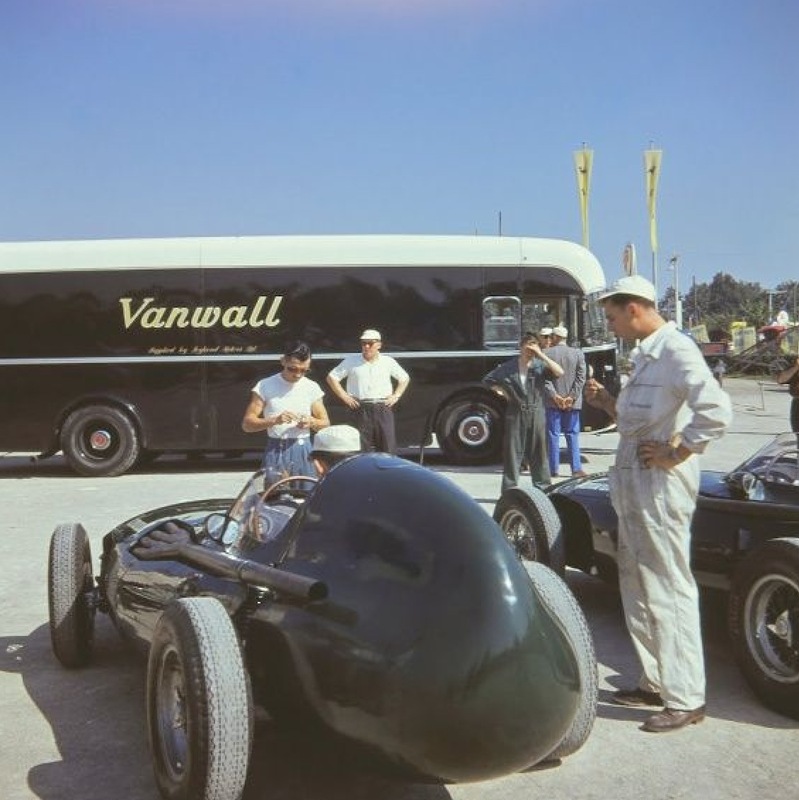 Oooh, la, la from the rear tho. 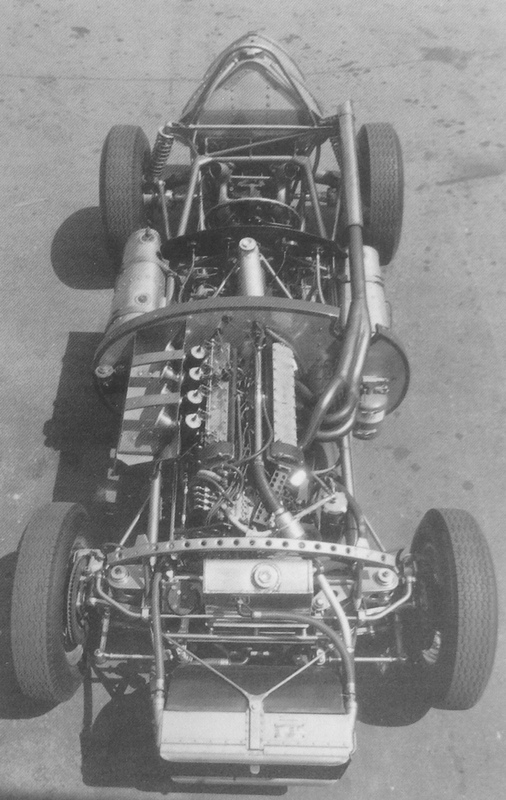 All things Italian look great from the back!? 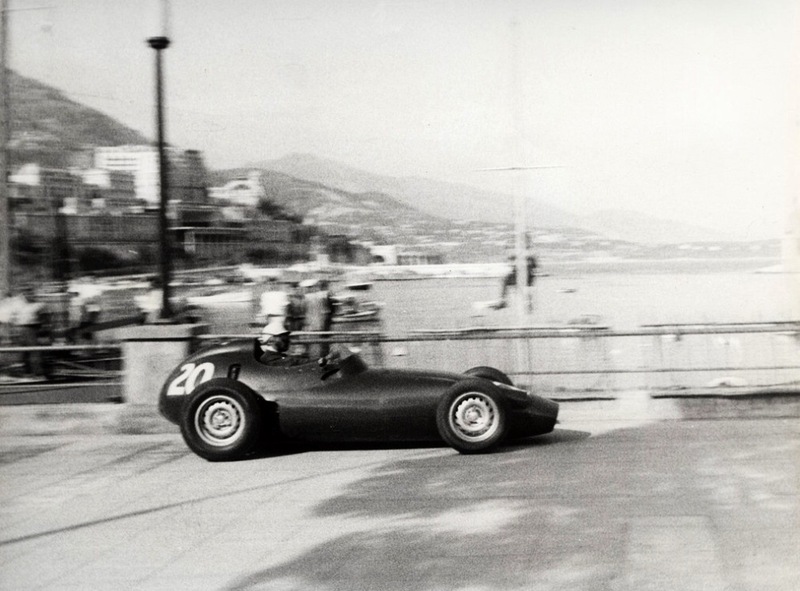 Hill hustling his Dino, thru the Mirabeau right hander. 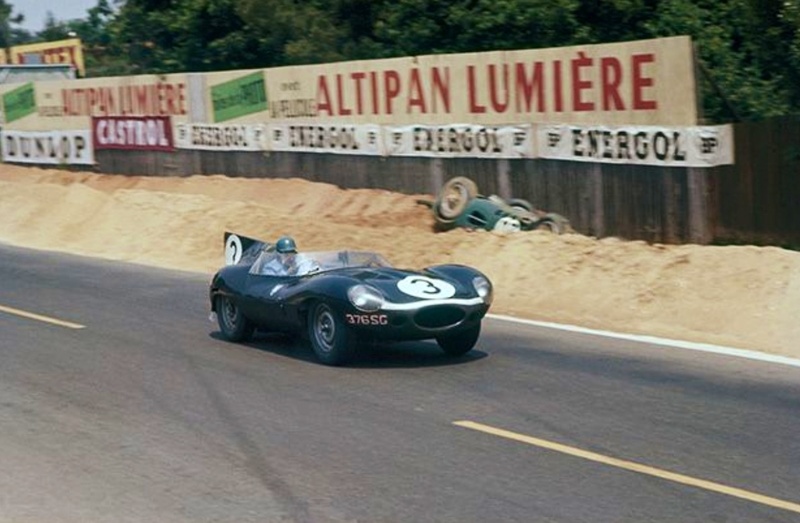 Have a look at Phil’s car below in August on the hugely picturesque and dangerous Monsanto road course during the Portuguese GP, DNF when Lotus 16 mounted Hill G spun in his path taking out both cars. 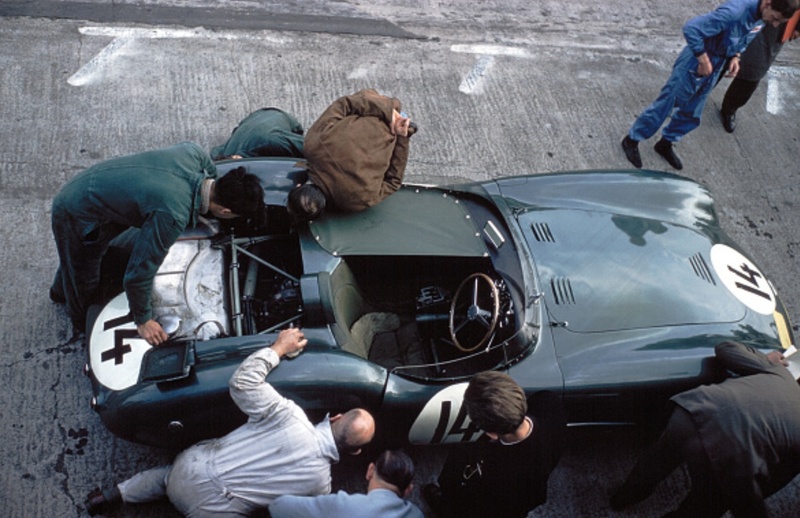 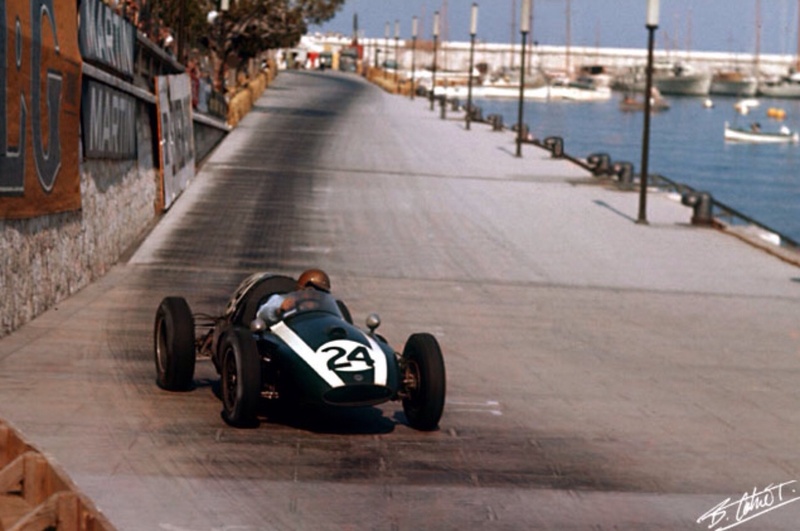 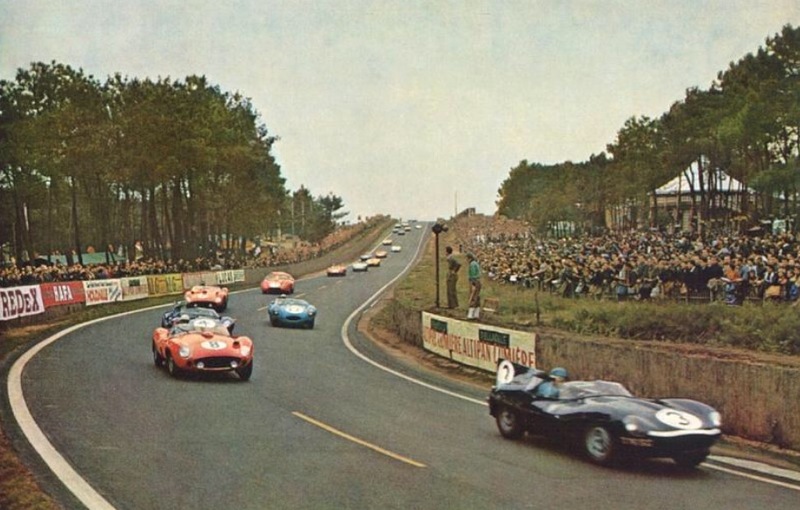 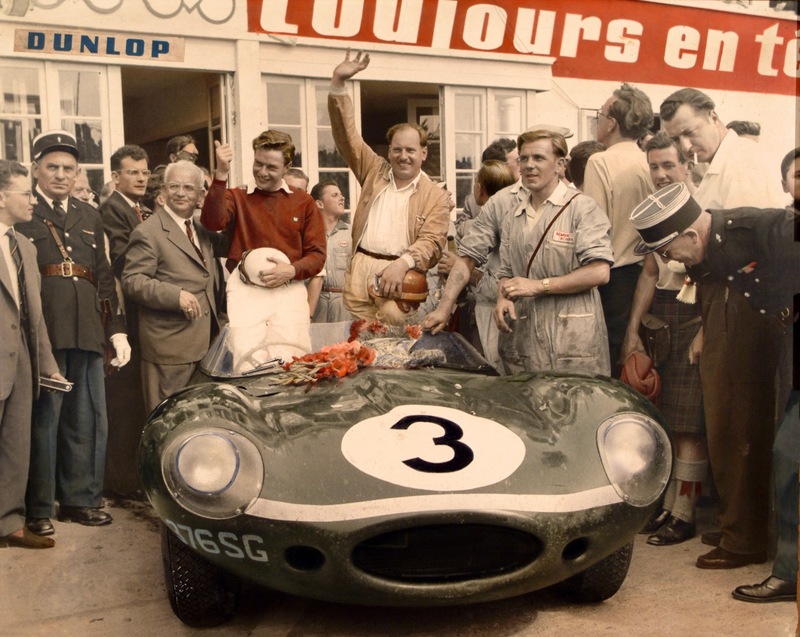 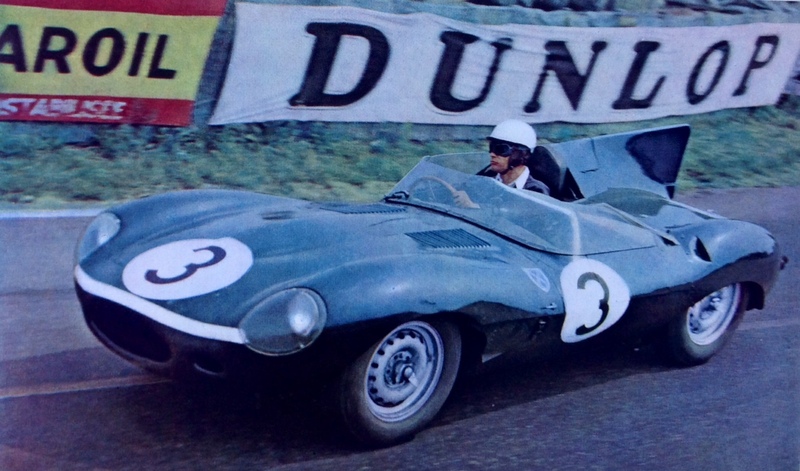 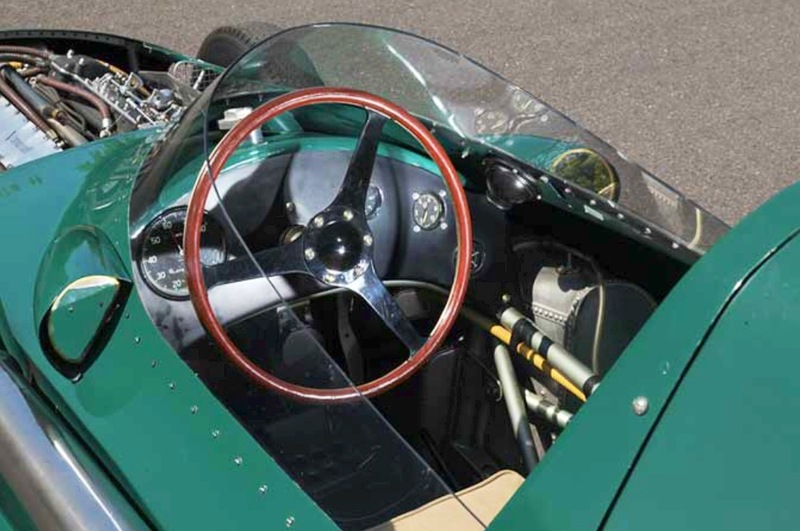 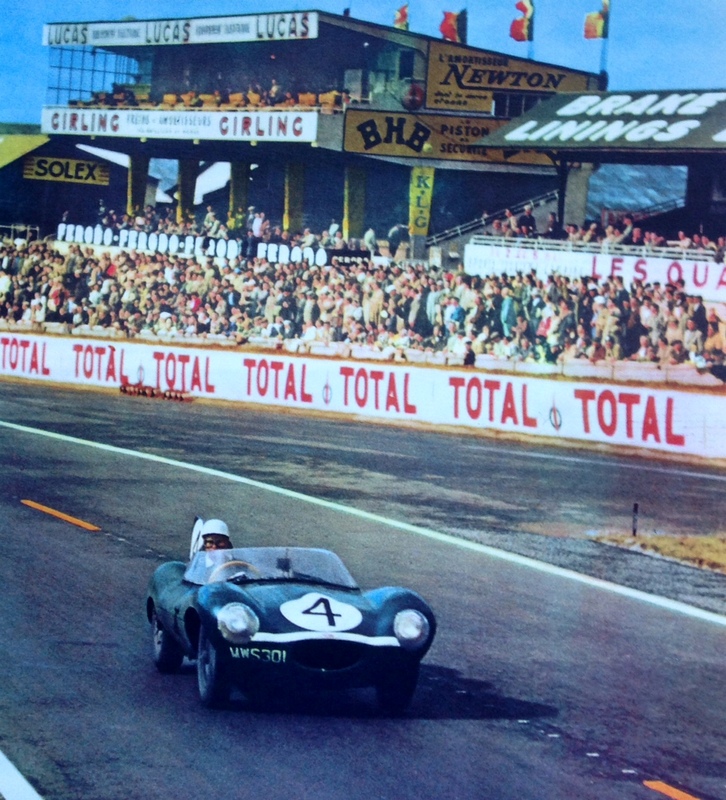 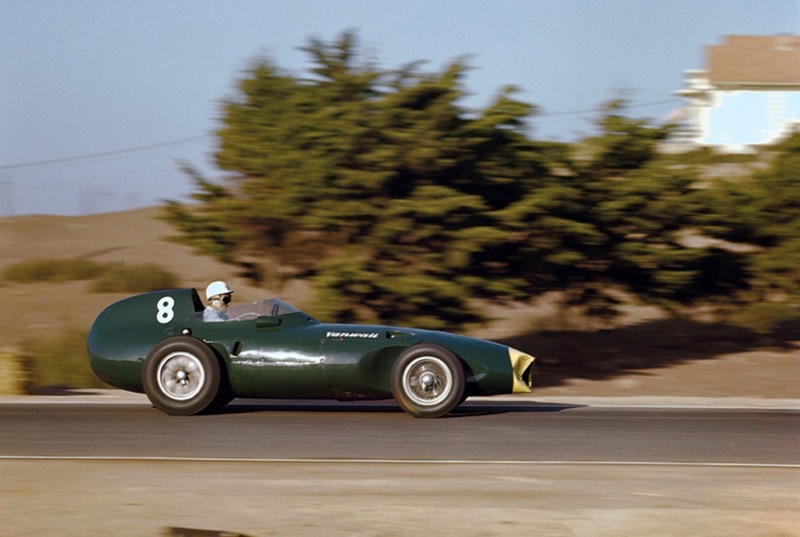 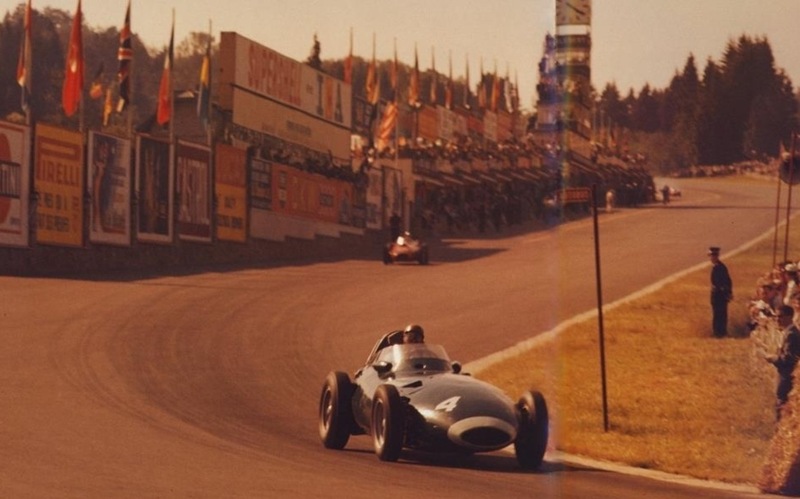 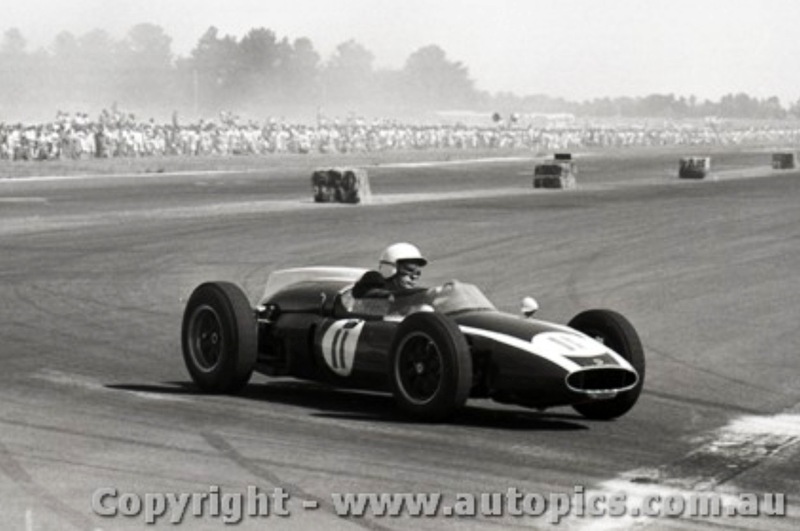 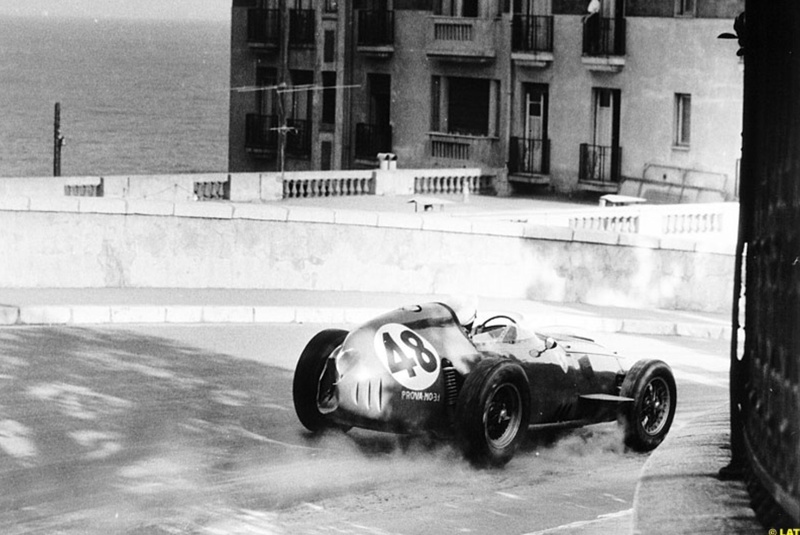 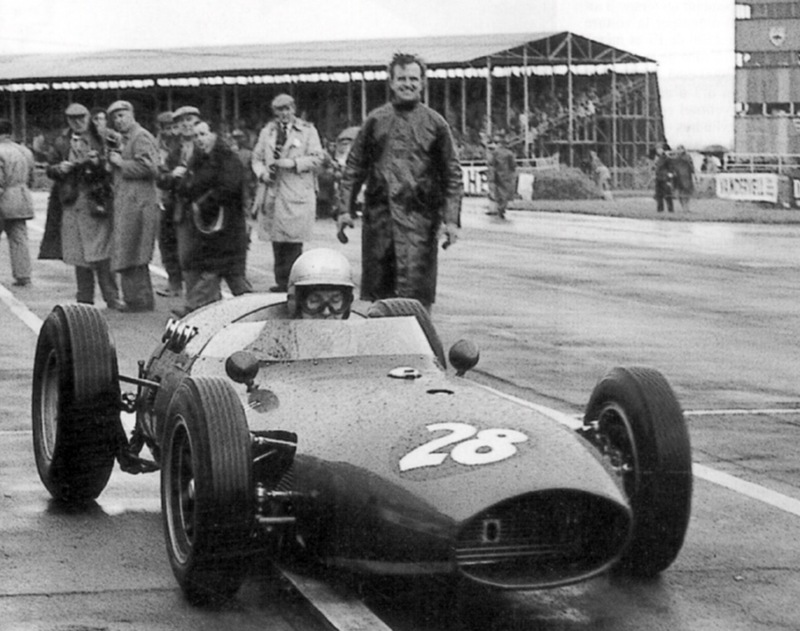 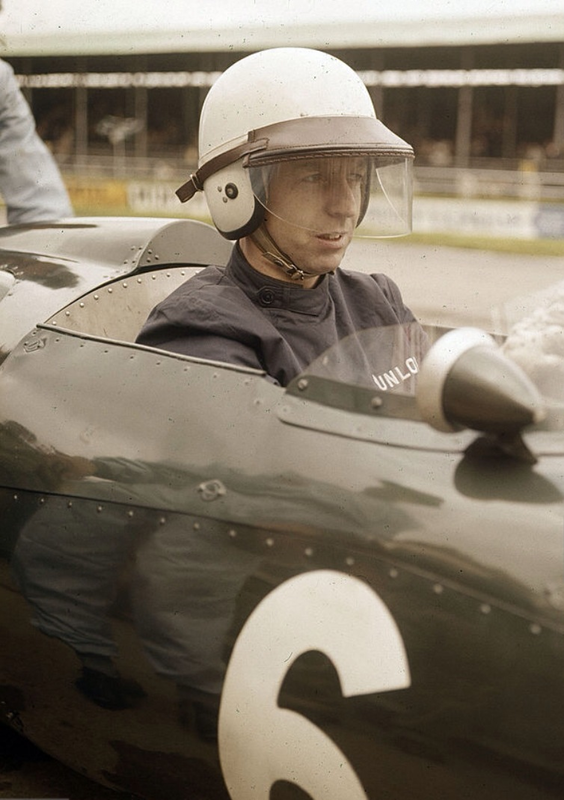 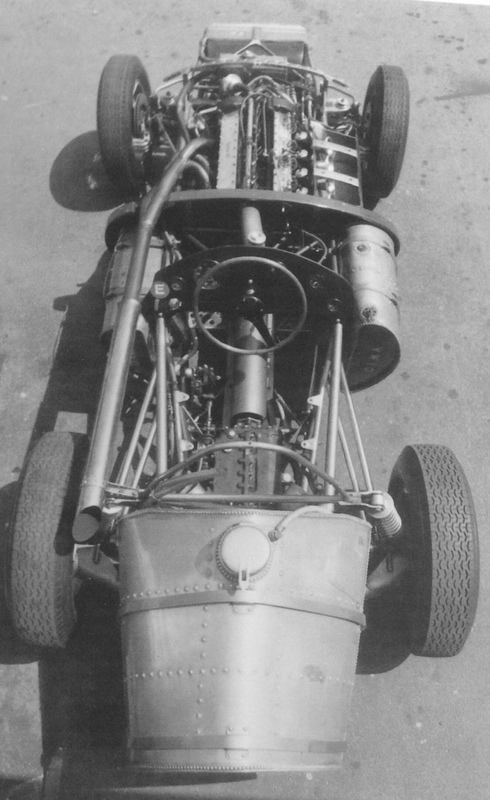 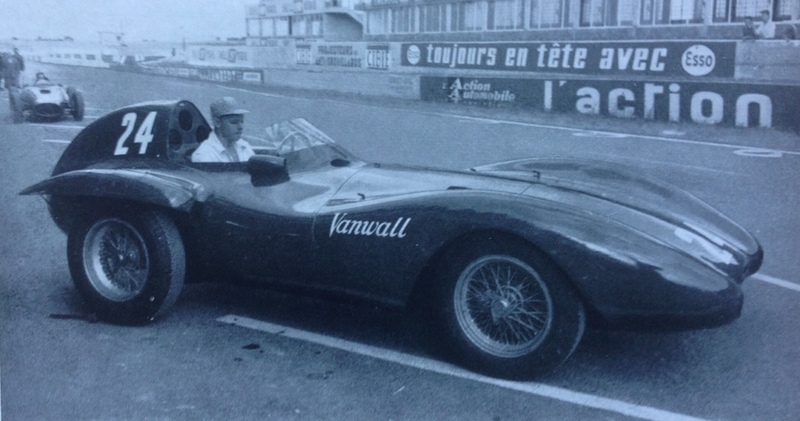 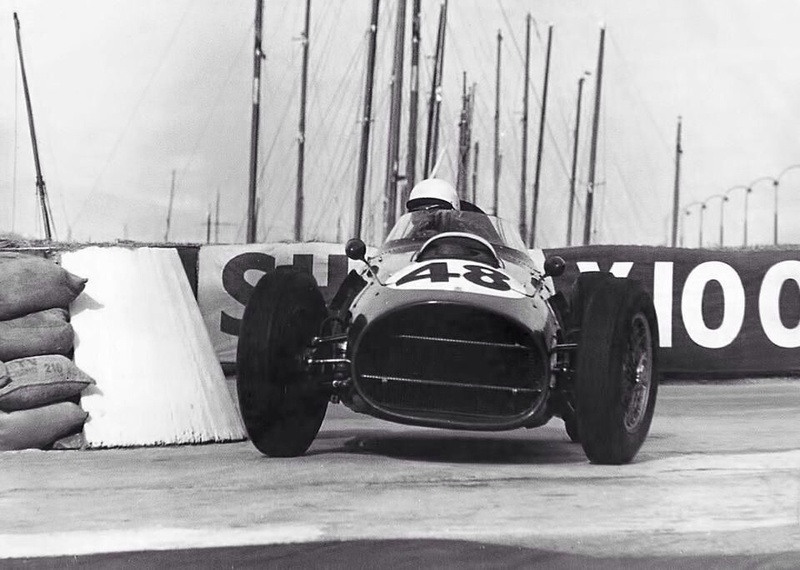 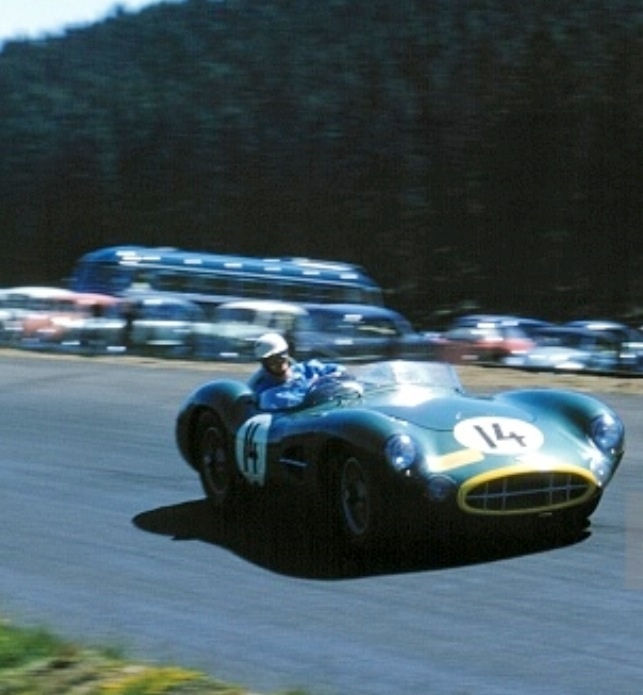 Moss won in a T51 Cooper Climax from Masten Gregory similarly mounted, Gurney the best placed Ferrari in 3rd. 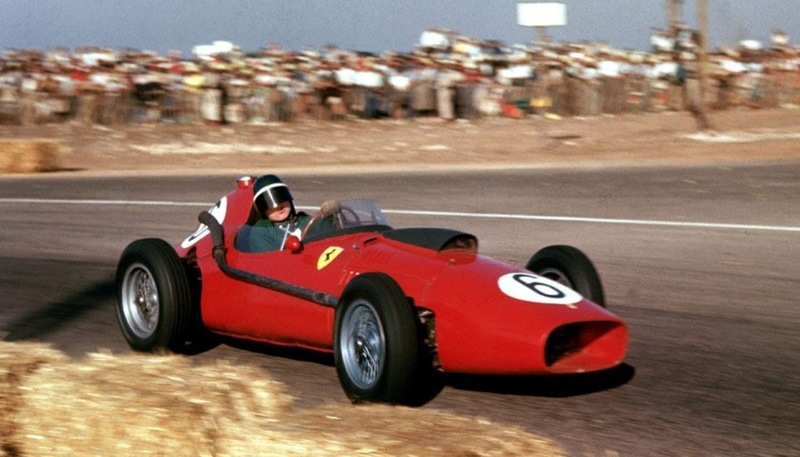 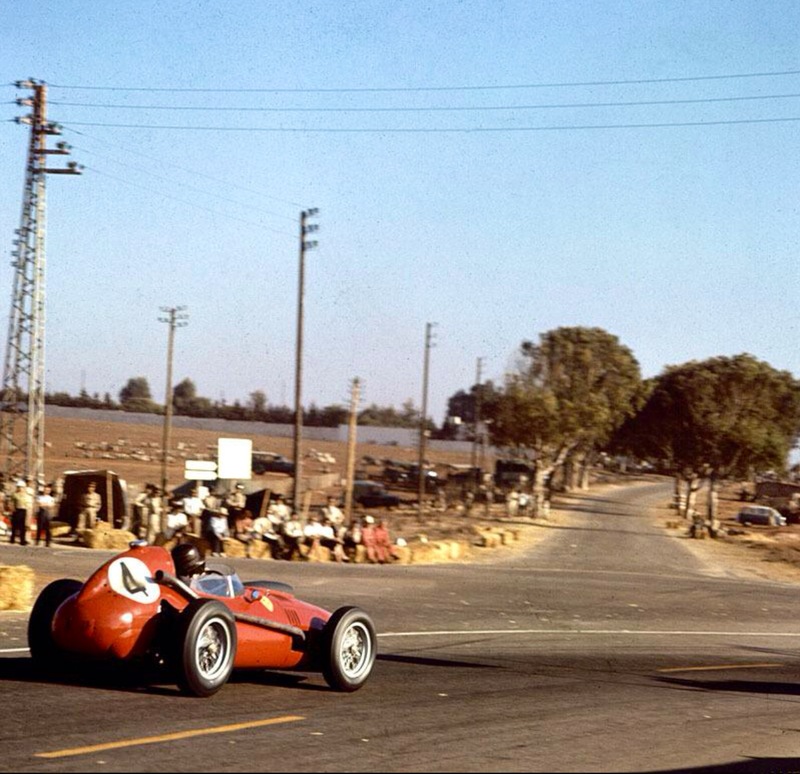 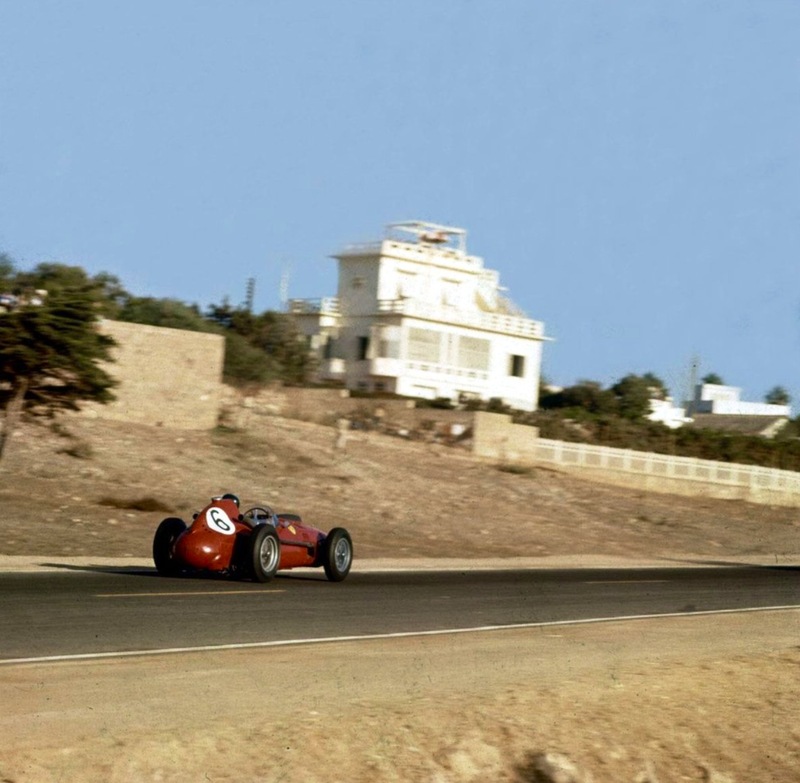 Photo is another masterpiece of composition and high-speed shutter work during the Moroccan GP at Ain-Diab, Casablanca Morocco on 19 October 1958. 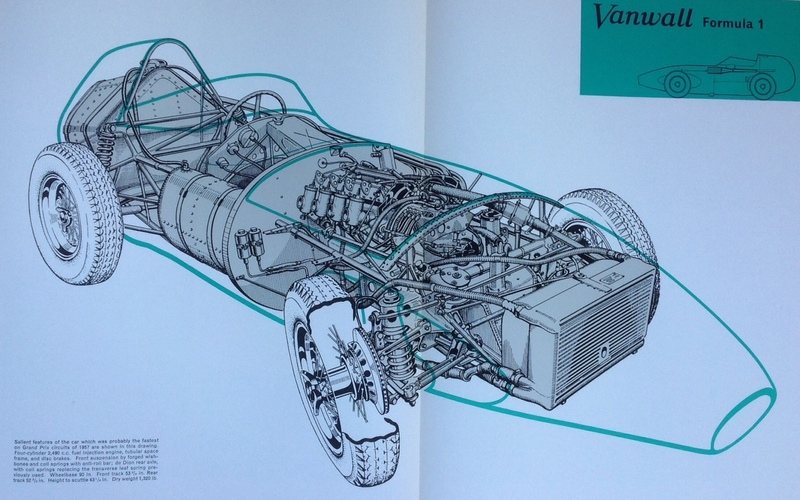 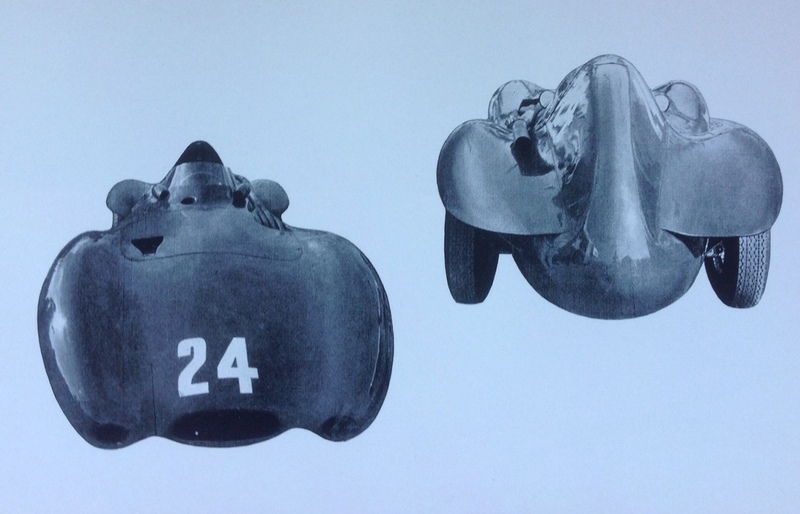 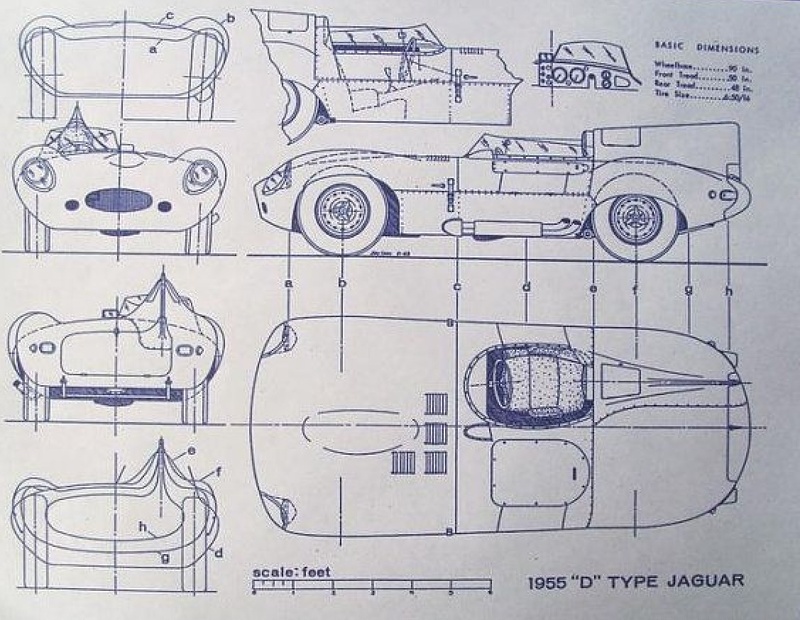 Check out the different tail treatment from the later cars earlier in the article and ‘three piece’ fabrication of the Ferrari’s rear tail section comprising from driver back; the fuel tank, then oil tank and finally small curvaceous endplate, Italian panel bashing at its best.